This courtroom sketch depicts Paul Manafort, fourth from right, standing with his lawyers in front of U.S. district Judge T.S. Ellis III, center rear, and the selected jury, seated left, during the jury selection of his trial at the Alexandria Federal Courthouse in Alexandria, Virginia, July 31, 2018. A jury of six men and six women was impaneled on Tuesday afternoon for the closely watched financial crimes trial of former Trump campaign chairman Paul Manafort in Alexandria, Virginia. Manafort, 69, is on trial for tax and bank fraud charges related to his political consulting and lobbying work for politicians in Ukraine. The trial of Manafort, who briefly headed President Donald Trump's 2016 presidential campaign, is the only to arise so far from special counsel Robert Mueller’s investigation of Russian interference in the vote. The jurors – 10 whites and two Asian-Americans -- who will decide Manafort’s guilt or innocence were selected from a pool of several dozen candidates. Four alternate jurors were also selected. Prosecutors and defense lawyers objected to nearly two dozen other candidates in the juror pool for unknown reasons. With the jury impaneled, the trial is scheduled to continue Tuesday afternoon with 30-minute opening statements by prosecutors and defense lawyers. On the surface, the criminal charges against Manafort — tax evasion, failure to report foreign bank accounts and fraudulently obtaining bank loans — are unrelated to the core of Mueller’s investigation into whether the Trump campaign colluded with Russia to subvert the 2016 U.S. national election. The charges stem from Manafort’s decade-long lobbying and political consulting work for Ukraine’s former president, Viktor Yanukovych. FILE - Ukraine's ousted president Viktor Yanukovych speaks at a news conference in Rostov-on-Don, Russia, Nov. 25, 2016. While working for Yanukovych and his pro-Russia Party of Regions between 2006 and 2015, Manafort and his former business partner, Rick Gates, allegedly earned tens of millions of dollars in fees while hiding the income from the Internal Revenue Service. To avoid paying hefty taxes, prosecutors say, they set up secret shell companies and offshore accounts to funnel their Ukrainian proceeds disguised as “loans” to U.S. accounts to buy multimillion dollar properties and luxury goods. 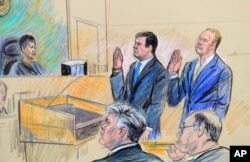 FILE - A court artist drawing shows President Donald Trump's former campaign chairman, Paul Manafort, center standing and Manafort's business associate, Rick Gates, in federal court in Washington, Oct. 30, 2017, before U.S. Magistrate Judge Deborah A. Robinson. 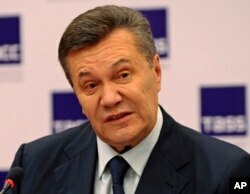 After Yanukovych was deposed in 2014 and their Ukrainian income dwindled, Manafort and Gates allegedly came up with another scheme to obtain money: the two used their real estate properties in the United States as collateral to fraudulently secure more than $20 million in bank loans by “falsely inflating” their income. In all, prosecutors say, more than $75 million flowed through the offshore accounts Manafort and Gates set up. But prosecutors’ star witness is likely to be Gates, who worked closely with Manafort in Ukraine and later followed him into Trump’s campaign as deputy chairman. 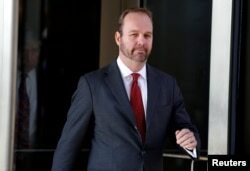 FILE - Rick Gates, former campaign aide to U.S. President Donald Trump, departs after a bond hearing at U.S. District Court in Washington.